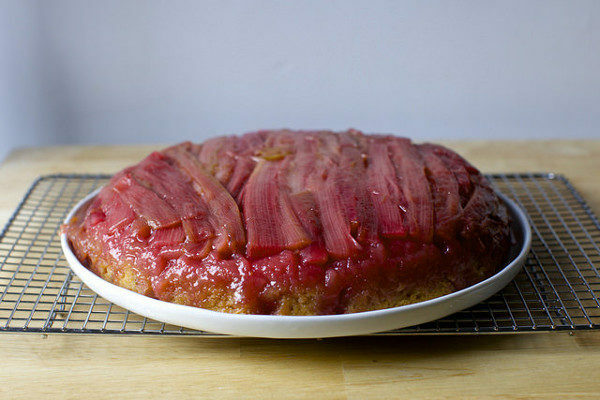 Rhubarb is a very versatile fruit. It' makes a great compote, crisp, tart, pie or cake. This is an excellent low carb choice and delicious too! It is so beautiful your friends will be so impressed. Preheat oven to 350°F. Can be served warm with a dollop of whipped cream, or chill and serve cold. Cream together in large mixing bowl butter, cream cheese and 1 cup Splenda. Add eggs – one at a time – beating well after each. Add 2 Tablespoons Diabetisweet Brown Sugar Substitute, mace, and extracts and beat again. Mix almond flour with baking powder and add egg to mixture a little at a time while beating. Set aside. In small bowl, mix 1 Tablespoon Splenda, 2 Tablespoons Diabetisweet Brown Sugar Substitute and 1/4 cup Erythritol. In prepared baking pan, sprinkle sweetener mixture across the bottom evenly. It should 'stick' to the cooking spray at the bottom. Then lay the thin pineapple slices to cover bed of sweetener in a pretty pattern. Place a cherry inside each ring and if you wish, a few around the outsides. Carefully spoon cake batter onto pineapple/cherry bed being careful not to disturb your layout. If you've used a springform pan, be sure to place it on a cookie sheet before baking to catch leaking juices from the bottom. Bake at 350°F for 45-50 minutes or until golden and cracking on surface. Allow to cool for 10 minutes, then carefully invert onto large serving plate. If any cherries or pineapples become displaced, gently nudge them back into place. Pour syrup evenly over cake top, allowing it to sink into the mix. Can be served warm with a dollop of whipped cream, or chill and serve cold. In the bottom of a 10" cast iron or oven proof pan place the butter, lemon zest, 3/4 cup xylitol and salt. Heat over medium heat until melted and sweetener is dissolved. 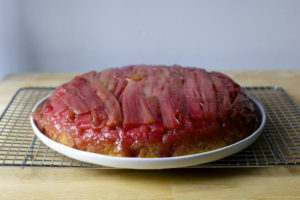 Add rhubarb. and cook for 3 to 4 minutes until it starts to tender and liquids begin to release. Remove from heat and set aside. Cream together in large mixing bowl butter, cream cheese and 1 cup Xylitol. Mix almond flour with baking powder and add egg to mixture a little at a time while beating. Set aside. .Add eggs – one at a time – beating well after each. Carefully spoon cake batter onto rhubarb bed being careful not to disturb your layout. Bake at 350°F for 45-50 minutes or until golden and cracking on surface. to cool for 10 minutes, then carefully invert onto large serving plate.